Be There Every Day. Give Monthly. Be more than a supporter – become a Constant Companion!! Being a Constant Companion is one of our newest official giving opportunities – a recurring donor club to help the underserved and abandoned pets in our community. Recurring giving is an excellent way to put more of your contribution to work for animals in need! Why? More lives saved: Your repeat gift ensures the animals in our care receive the essentials they need such as food, shelter and veterinary care. Increase your impact: Even a small gift every month adds up for the animals throughout the year. Reduces our costs and your time: because your credit card gifts are automatically processed through our secure system, we save money and resources and this saving directly benefits the animals we all love! 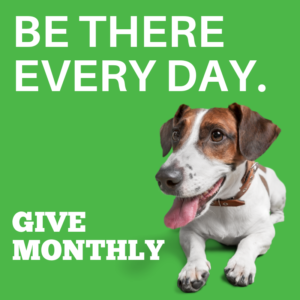 As a founding Constant Companion… Your monthly donation can bring hope to the thousands of animals that we serve each year, and help many more obtain a chance to a family to love, perhaps the first they’ve ever known. It’s extremely simple to become a Constant Companion! You never have to remember to write a check or mail an envelope. You determine the amount you contribute on a regular basis and we do the rest! Just fill out the form online and you’re done!